Located in the northern part of the island atop a hill in Barangay Yapak is Alta Vista de Boracay. It has more than 500 units offering 2 types of rooms that have a balcony and kitchenette. Its location gives it that peaceful feeling of privacy combined with luxury. The view from the hilltop is also breathtaking and is one of the most picturesque sights to behold on the island. From any vantage point in this hotel, you can glimpse the beautiful sea and the surrounding mountains of Boracay. This new condotel also has a restaurant, lounge bars, pool, spa, steam room, yoga deck, children’s playground, karaoke room, shuttle service to White Beach and Foreign Currency Exchange. For those on corporate meetings or other such outings, you might also want to consider this resort for its Private Function room which can easily fit 80 guests. There is also the Ecoville Convention Center that has a capacity for over 3000 guests. The casual elegance of the service and accommodations offered here set you right at home in paradise. 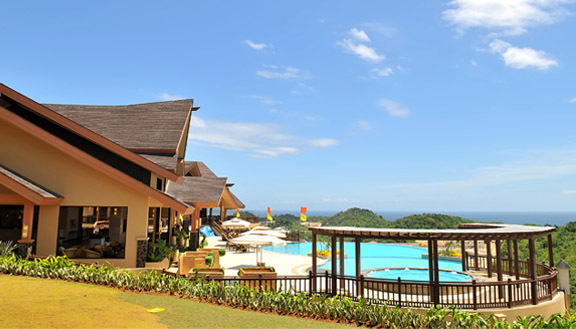 To return from Alta Vista de Boracay to Boracay Hotels and Resorts click here.